20th September, Yancheng: Korea swept the Men's and Women's 5-Player Team gold medals of the 28th East Asian Tenpin Bowling Championships with host, China A earning both the Men's and Women's silver medals. Korea's Lee Won Seok, Jo Young Bin, Lee Jung Soo, Han Jae Hyeon and Oh Jin Won took the first match, 225-186 in the best-of-3 Bakers-format final but narrowly lost to China A's Qi Wankang, Cai Qilin, Chen Jiaming, Xu Chen and Wang Zhiyong, 193-195 in the second match forcing a third and final deciding match. China were simply outclassed in the third match as the Korean quintet romped home a comfortable 247-188 victory to claim their third gold medal of the championships. Korea had to work hard to advance to the final. They won the first match, 214-159 against fourth-seed, Hong Kong in the semi-finals but lost 190-231 in the second to go into a third match decider. Korea edged Hong Kong, 191-182 to boot their place in the final. China A was also forced into a third deciding match in the other semi. Second-seed Chinese Taipei won the first match, 213-193 but lost the second match, 151-172. The Taiwaneses quintet were unable to bounce back going down 184-222 to take home a second bronze medal. In the earlier second block preliminaries, the order remained unchanged from the first block with Korea earning top spot with 6164. Chinese Taipei finished second with 6049 followed by China A in third with 6035. Hong Kong advance to the semi-finals in fourth with 5765. 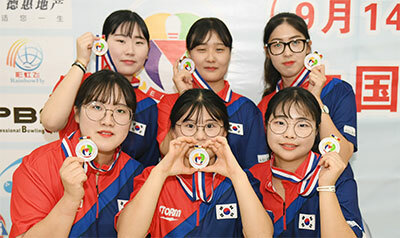 In the women's division, Korea's Choi Hyeon Ji, Hong Hyeon Jeong, Kim Chae Won, Min Hyeon Ji and Han Jin A finally won their first gold medal of the championships in the 5-Player Team event. The Koreans edged topseed, China A, 180-179 in the first match and 203-190 in the second for a well-deserved victory. China A's Peng Rui, Li Qing, Kong Min, Fan Juanjuan and Zhang Yuhong, after the hard work put in in the earlier second block preliminaries to earn top spot with 6014, had to settle for the silver medal. Korea, who was seeded second defeated third-seed, Chinese Taipei, 191-196, 197-179 and 182-168 to advance to the final. Chinese Taipei's quintet of Wang Ting-Wen, Yang Hao-Ting, Wang Yu-Huei, Li Shiau-Ping and Wang Ya-Ting took home their second brzone medal. All was not lost as China A came away with the gold and silver medals after Kong Min and Peng Rui finished one-two in the Women's All-Events standings with 4907 and 4905 respectively. 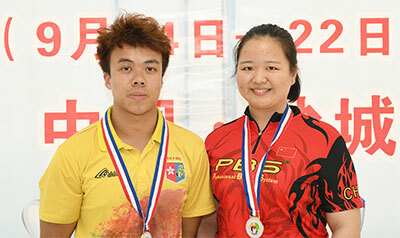 Wang Ya-TIng added a third bronze medal with 4768. James Lui of Hong Kong won his first individual gold medal after topping the Men's All-Events standings with 5332. Overnight leader, Lee Won Seok and his compatriot, Oh Jin Won earned the silver and bronze medals with 5259 and 5164 respectively. The top 16 men and top 16 women based on their respective All-Events standings qualified for the Elimination Knockout Masters Finals. The Men's Top 16 Round will take place after the break while the Women's Top 16 Round will be held tomorrow morning. The championships will conclude with the Men's and Women's semi-finals and final matches to determine the winners. A Victory Banquet will be hosted by Yancheng Bowling Association soon after. Korea leads the overall medal tally with 4 gold, 3 silver and 8 bronze medals. China A is second with 3 gold, 6 silver and 1 bronze medal while Hong Kong has a medal haul of 2-1-3 and Chinese Taipei 1-0-5.